I‘ve been sorting and culling old photos this week. I need to organize them for a couple of annual projects (a calendar for my parents for Christmas, and an annual family photo book) and my hard drive is also more than 80%, almost 90% full. 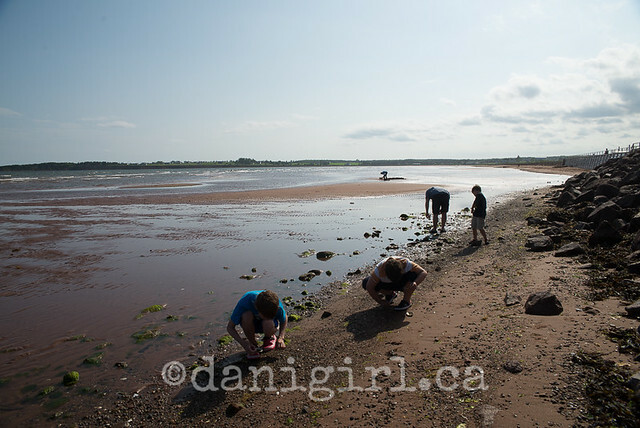 So I’ve had my nose in folder upon folder of the photos I’ve taken since 2014, and none of them makes me more happy and more achy with nostalgia than the ones I took in PEI. That’s the view from the Panmure Island lighthouse. Siiiiiiiigh. Did I tell you we’ve already booked for summer 2015? We decided to book for two weeks on the north part of the island, not far from Greenwich national park. And in a stunningly responsible turn of events, we’ve already saved up more than 2/3 the cost of the cottage rental. Yay us! Amazing what you can do with the proper motivation. I haven’t entirely given up on the idea of moving to PEI one day. We talk about it all the time, but I don’t see it as being practical any time before all the kids are grown up and (whimper) moved out. I can, however, see us spending incrementally more of each summer there. The idea of the gorgeous red sand, the emerald fields and the blue ocean will do a lot to carry me through the upcoming winter, that’s for sure. Have you ever fallen cataclysmically in love with a place? Where? What did you do about it? Watch out for that wrong turn in Maine when you’re outrunning a hurricane! It’s been a week since we left PEI. I think maybe I’m drawing out the blogging of our vacation so I can continue to relive it in real time. We haven’t really left until the blog posts are done, right? You might remember that through a fluke of good timing our departure was conveniently scheduled for the very day Hurricane Arthur was skimming its way up the Atlantic coast toward the Maritimes. 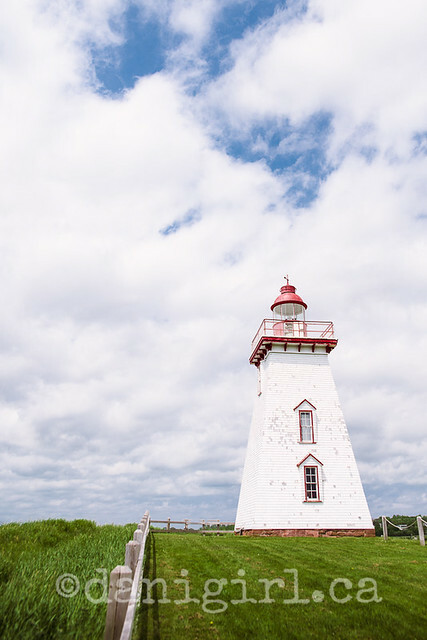 As we regretfully packed up the car and headed back across the Island to the Confederation Bridge and then across the southern boundary of New Brunswick, we kept a wary eye on the (generally benign) summer skies. Interestingly, the temperature plummeted 10C and fog rolled in as we passed through St John, and then just as abruptly burned off again as we continued on toward the border at Saint Stephen. We’d chosen that route, as opposed to Google Map’s suggestion to cross at Houlton, Maine and zip down the I-95, because I hate to backtrack, and the idea of driving all the way back to Woodstock NB, where we had stayed our first night, and then continuing for two more hours on to Skowhegan Maine down the interstate seemed unnecessary repetition. What I didn’t account for is how desolate the highway is through Maine from Calais to Bangor – yikes! Very little cellular reception, lots of abandoned and derelict properties, and not a soul on the roads. With a hurricane pending. You can imagine our discomfort. Also, while the drive on the New Brunswick side of the border seemed a lot less, um, downtrodden, it was pretty much the same as every NB highway I’ve seen – trees, trees and more trees. No offense to my friends who live in or hail from New Brunswick, but something about the province just makes me itch to be able to get through it more quickly. Maybe that’s why the speed limit is 110 km/h? Regardless, we made it to Bangor just as the rain started, and made it on to Skowhegan without much more ado. Of course, having arrived on Independence Day made it a bit more challenging to find an open place for dinner, but when we did stumble across the Whit’s End Bar & Grill (thank you Trip Advisor!) we found an excellent family restaurant with fantastic fried haddock. Yum! With not much else to do, the rain becoming more insistent and a few hours to kill until bedtime, we entertained ourselves in the tiny convenience store appended to a gas station where we marveled over the selection of American candy. No, we don’t get out much. Beloved found candy for grown-ups too: a whole selection of Duck Commander wine! You find all the classiest treats in the gas bar! Another thing I learned on this trip is that you get better service and a greater willingness to accommodate families of five travelers in smaller motels than in the big chains. The Belmont Motel was cheap, clean and more than willing to offer up a cot for an extra child into a room with two queen beds, and cheaper by half than the Best Western that would officially only accommodate four of us. Plus the owner and his cat were both charmers. By Saturday morning, we all just wanted to be back home. The soggy remnants of Hurricane Arthur ensured a constant driving rain, although no significant winds in our neck of the woods at least, and the wet grey morning perfectly matched my mood as Tim Horton’s failed to deliver a restaurant in Skowhegan that was clearly indicated on the Timmy Me app. Luckily for everyone but me, there was a WalMart with a Dunkin Donuts directly across from the motel, so our most basic coffee needs were met and Beloved managed to collect some of his favourite American sugar bomb cereals to bring home. The last lesson we learned on the way home is to be careful when travelling through rural Maine and following a printout of Google Maps because of the spotty cellular coverage that you don’t veer left when you were supposed to forge ahead. Although we had passed a few signs assuring us the Canadian border was less than 50 miles ahead, when we’d driven for more than an hour up and then down and then up again on twisty mountain roads and we suddenly found ourselves in Hillbilly Hills, New Hampshire instead of Canada but still with no cellular signal – well, you can imagine our dismay. This is the route we should have followed. This is the route we actually followed, which added not the optimistic 30 minutes that Google Maps supposes, but I’m guessing at least 90 minutes to the full trip. The good news is that our little detour was truly gorgeous – we passed Sugarloaf, the Green Mountaints and the Dixville Notch (population 12) as well as endless hunting and fishing camps, but alarmingly few gas stations and other signs of civilization. And did I mention no cellular signal? Yeah. 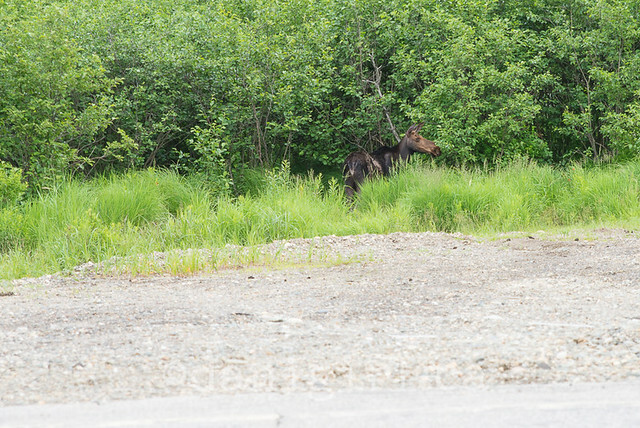 We did see a moose, though, so that was kind of cool! Sadly, he didn’t know the way to Canada, either. Eventually, blessedly, we picked up a signal and oriented ourselves to a small border crossing at Canaan, which may have been in either New Hampshire or Vermont – by that time, I’d lost track. We pointed ourselves in that direction, figured out the most direct route, and promptly got stuck in Colebrook NH as we tried to turn on to Route 3 N, aka Main Street Colebrook, and got stuck watching their Independence Day parade, delayed by a day by Hurricane Arthur. Vexed yet AGAIN by a hurricane! So that added another good 20 – 30 minutes to the trip, but by that time all we could do was laugh. Well, Beloved and I laughed. The kids were not nearly so amused by the parade as one might have expected. Even kid nerves can be worn a little thin by excessive amounts of travel delays and mishaps, I guess. We did eventually make it back into Canada, and were delighted by the four bars of cellular access and the wide, flat, well-populated highways of the Eastern Townships. Such amazingly gorgeous countryside that is – and all we wanted to do was zip through it as fast as the speed limit would carry us. We finally did make it home about two hours later than I’d estimated leaving the motel in Skowhagen, but we made it intact and without serious mishap. And hey, it’s all good when it makes for good bloggy fodder, right? 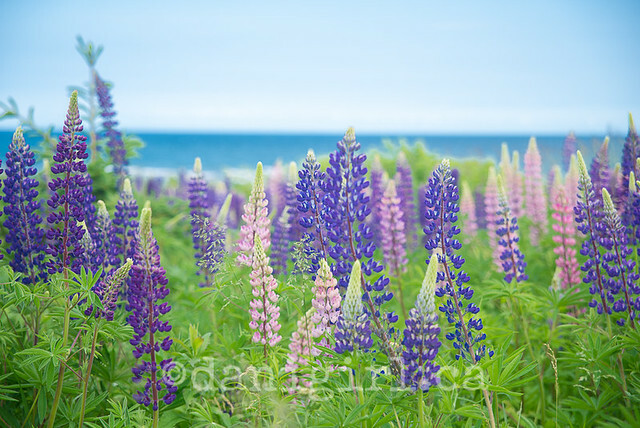 One of the unexpected beauties of our trip to Prince Edward Island were the beautiful pink, purple, yellow and cream lupins growing wild almost everywhere we went. These ones were growing between the dunes at Basin Head provincial park, but they were in just about every vista we saw. I don’t remember ever seeing them around Ottawa – surely we’re in a similar temperate zone, can I grow them here? Honestly, before we went to PEI, everything I knew about lupins I learned from Monty Python! 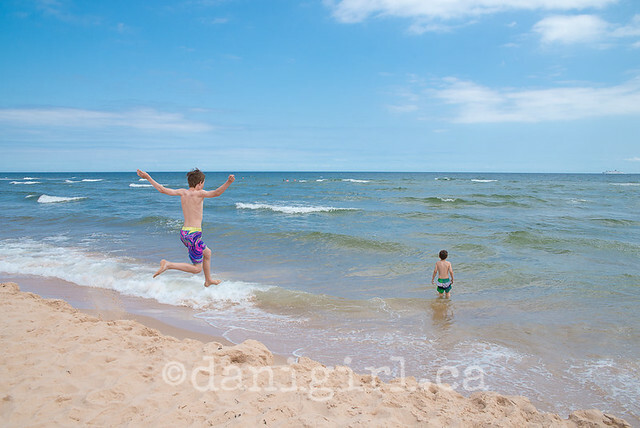 Photo of the day: Beach jump! I wouldn’t have thought a rocky beach would be preferable to a sandy beach. 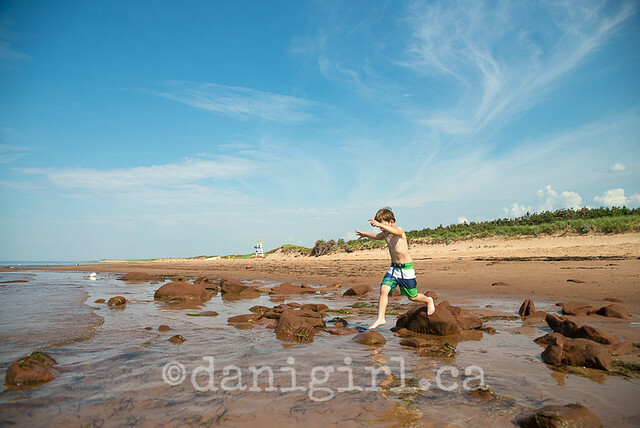 Luckily, the beach at Greenwich PEI National Park has both gorgeous sand and great big red sandstone rocks for jumping. This is one of my favourite photos of the trip. 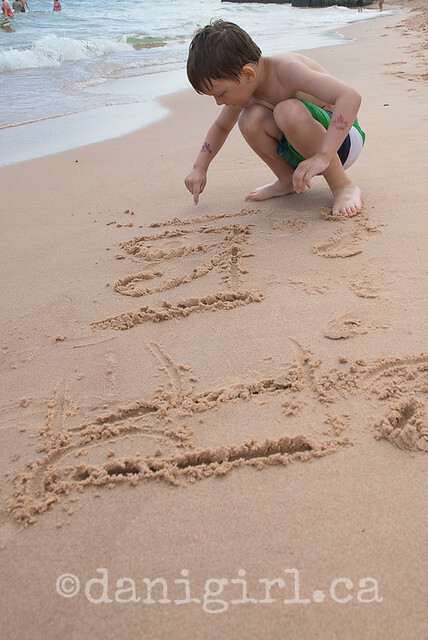 It says summer and sand and sea and play – all the things that comprise a wonderful day at the beach. Fifteen years ago on July 3, 1999 Beloved and I were married. 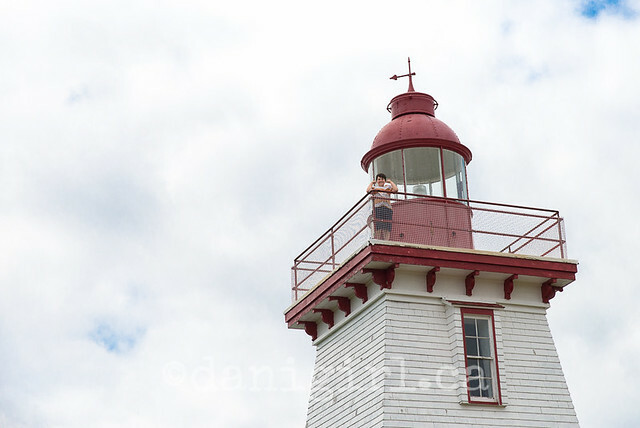 It seems fitting that 15 years of marriage is celebrated with the most fun day of our adventure on Prince Edward Island. It also seems fitting that it was our favourite day not by design but happy accident. That’s pretty much how we roll. Souris is a scenic 60 minute drive up the far eastern side of PEI from our home base of Murray Harbour North, conveniently passing through the town of Montague “the Beautiful” also known as “Montague, home of the only Tim Horton’s for 60 km in any direction.” We set off to Souris with two objectives in mind: Chef Michael Smith’s Flavour Shack, and beachcombing for sea glass. 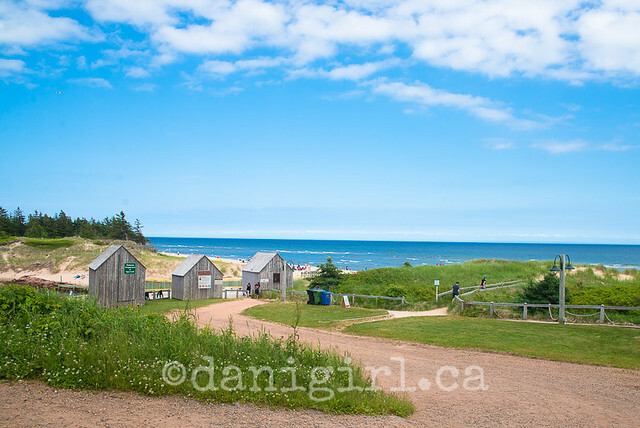 We nearly drove by the Flavour Shack on our way into town – it sits with a few other lovely little shops on a boardwalk on the beach right as you’re coming into Souris. While we chatted with the staff, I could hear Tristan and Simon talking to one of the young ladies affiliated with the Flavour Shack. (They all seemed to be related, but I lost track of who belonged to whom!) She was telling them about Basin Head with its “singing sands” and a bridge from which you could jump into the water. I have great admiration for a young woman who can speak with such kindness and enthusiasm to a couple of pre-teen boys! Once we had had our photos taken and tucked our new purchases safely into the car, we spent another little while wandering the beach right beside the boardwalk looking for sea glass and other treasures, but the tide was fairly high and while we filled our pockets, it was admittedly nothing quite like what we’d seen in Nova Scotia in 2010. We had a quick lunch in town (I’ve grown rather fond of seafood chowder, something I’d never tried before this trip!) 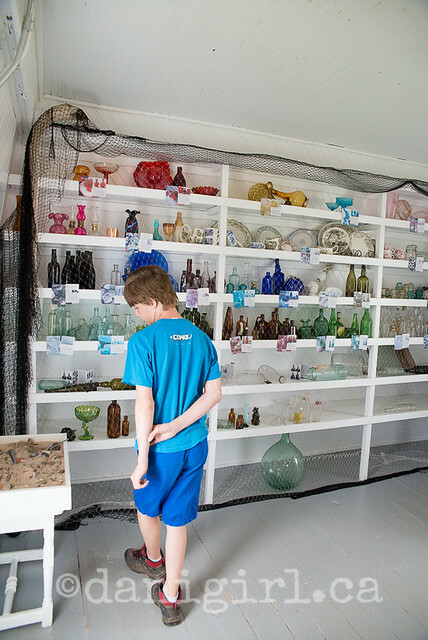 and explored the Souris Lighthouse with an exhibit of sea glass and its various sources. Tristan and Simon lobbied hard for a visit to Basin Head beach after listening to Brittany’s recommendation. 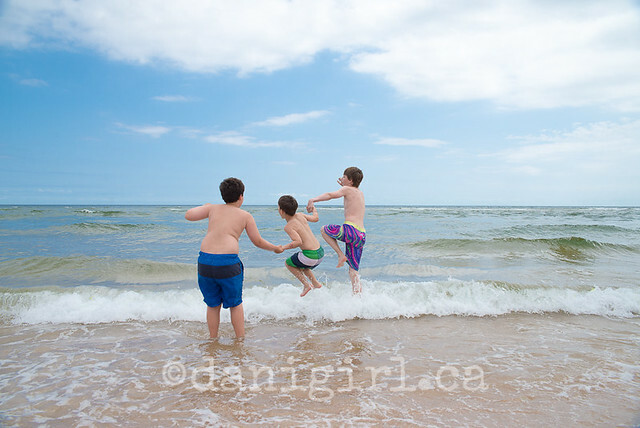 It had been windy and coolish in Souris, and after being pelted with sand the previous day at Cavendish beach the day before, we weren’t sure if we were up for another beach day. With nothing else in mind, we figured at the least we’d go and check out the singing sands and stick our toes in the surf. Best decision of the day! 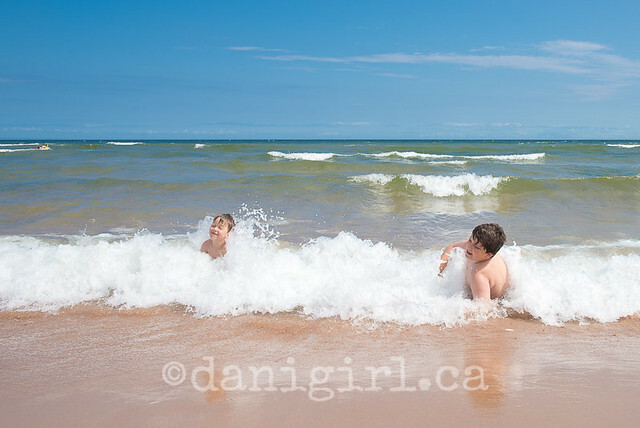 Despite the fact that the water was a brisk 13C, you can see we stuck a little more than our toes in the water. 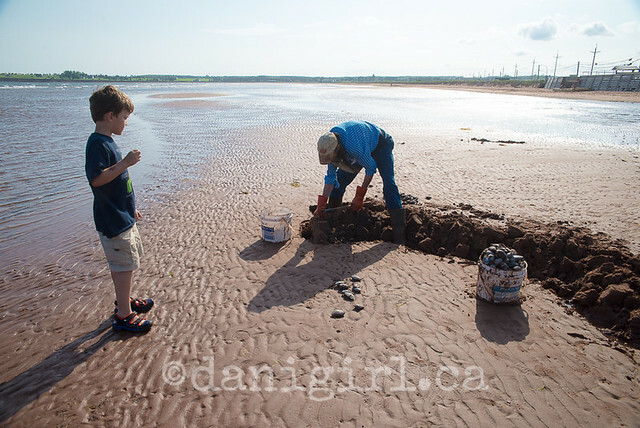 Sitting on the sand at Basin Harbour with my camera in my hand watching the boys play was the happiest I was in our whole vacation. It was truly a perfect afternoon and a wonderful way to celebrate our wedding anniversary. The boys were thwarted in their plans to jump from the bridge into the inlet, though. Brittany and her friends may get away with it, but the “NO JUMPING FROM BRIDGE” signs were enough to convince me it was a bad idea, despite the handful of teenagers who were doing just that. 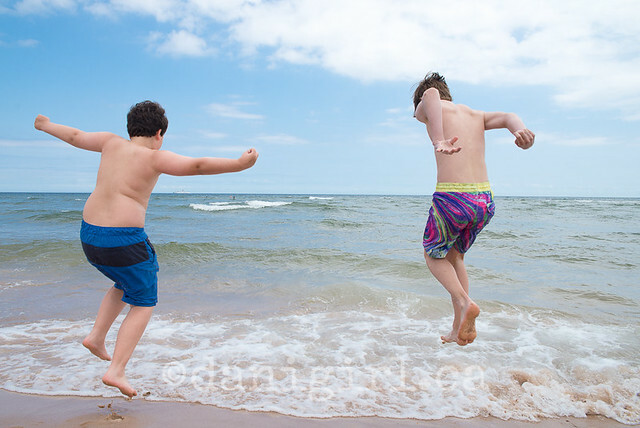 This was the only jumping in which the boys indulged at Basin Head – but it was enough to keep them happy! On the way home, the tide was receding and we couldn’t resist stopping one more time near the boardwalk to hunt for sea glass. There was a bounty! This is just a portion of what I had stashed in my pocket. And we chatted with this gentleman who was harvesting soft shell clams for a local restaurant. He’d only been at it for about 20 minutes and had filled one entire bucket. And this morning, a mere 72 hours after we left PEI, I found myself googling “Souris vacation rentals 2015”. I can’t think of a better endorsement for the day than that! This time, though, we’ll be sure to time our visit to catch either the Mermaid’s Tears sea glass festival or the Village Feast – if not both! So! Many! Photos! 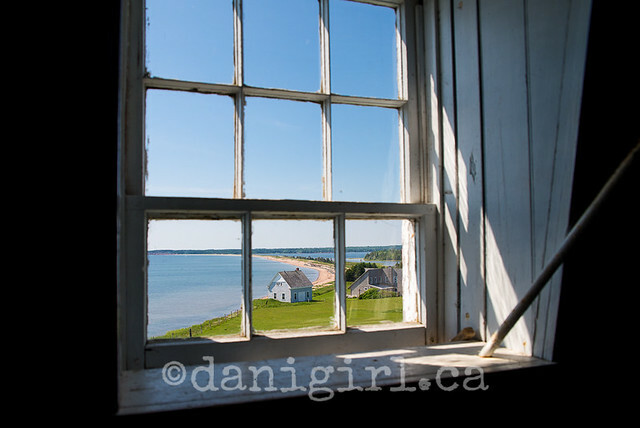 Now that we’re back home I’m hoping to work my way through a bunch of my favourite photos from PEI as the photo of the day over the next little while. This was from our last day. 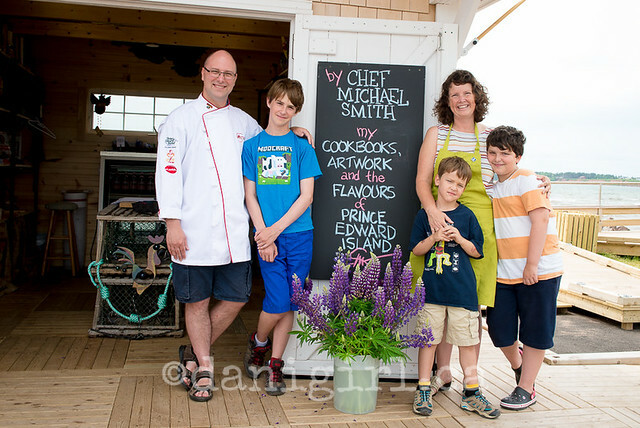 While we were visiting Chef Michael Smith’s Flavour Shack, some of the girls who work there recommended to the boys that we visit Basin Head provincial park. It turned out to be our favourite beach of all! More photos on Flickr, and lots more blogging to come. I wonder whether I’ll run out of blog posts or loads of laundry first?